The GFS II XL is an innovative revision of our original GFS. 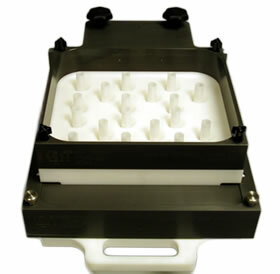 Our design eliminates the problems inherent to dedicated feeders past and present. By incorporating rise and fall with a small rear driven housing and simplified vertical "O" Ring gating, we know that this is one of the finest solid dose feeders of its type. Our vertical gating technique has many benefits, including: minimal cleaning up time and easy and gentle product release. Both sizes include our patented "O" Ring gating which is preferred over "T' pins by all of our customers. Patented "O" Ring vertical gating. No "T" pins. Would you like to have the option to get this dedicated feeder change part from a reputable source (other than the OEM) with savings of time and money without sacrificing quality? Now Gemel can build Aylward™ and SimTap™ style feeder change parts using our patented "O" Ring gating system and internal stop gate plates. No more hitting against the tubes. Change parts for OEM and aftermarket feeders utilizing our patented “O” ring gating system. 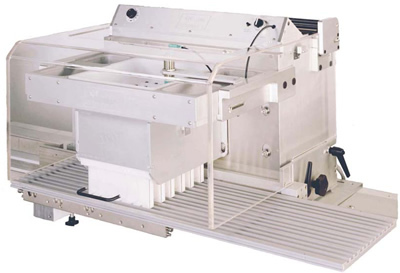 As of March 2012, we have implemented a Servo Indexer with laser web positioning for feeder testing. If you send us some formed web from your form, fill, seal machine, we can place it on the indexer, and fill the web with product to simulate the actual running of your machine. Any foreseeable issues with your feeder change parts can be addressed before it arrives at your facility. We at Gemel can help you with pricing and deliveries on dedicated feeder change parts and complete feed systems.